Ronald van der Meijs: Sculpture 'Even the sparrow has to practice' is ready! Sculpture 'Even the sparrow has to practice' is ready! The sculpture 'Even the sparrow has to practice' is finally finished. 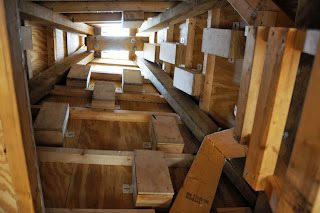 A sculpture with breading nests inside the tower of 6 meter hight. 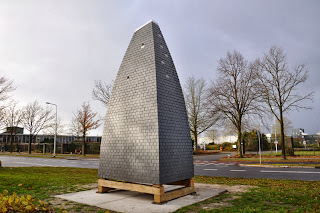 It's a sound sculpture near the NAXT building, a pop stage facility for young musicians in Almelo, Netherlands. Here you can see the breading nests inside the tower.